Why snip when you can slash? It was one of those realisations that seem so super obvious in hindsight. The kind that hits you as you are rinsing your hair in the shower causing you to run out naked (what? don't act like this has never happened to you?). The kind that makes you feel stupid for not seeing it sooner. 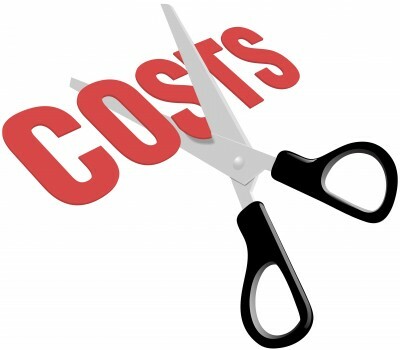 It relates to the way I had been going about cutting costs - turns out there's a better way. What if I told you I was able to save 90% on my monthly cellphone bill? Nice? Or what if I managed to reduce our car insurance premiums by 50%? You may be well impressed? Now, what if I told you I was able to save 10% off my monthly grocery expense? Not bad, but not as impressive? Right? In a previous post, I mentioned that we should visit our budgets from time to time and do some pruning. Things like finding cheaper insurance quotes, examining your banking fees, and getting rid of unused gym memberships and subscriptions. Make absolutely no mistake, this is great, and it definitely all helps. In the long run you could end up saving thousands of Rands, and if the savings are invested, you could end up with a nice investment worth hundreds of thousands of Rands. The thing is, we have limited time, energy and in some cases patience. So if we are going to be spending any of these precious resources to try and reduce expenses, surely we should be targeting the areas that can give us the most benefit? The "Big wins"? What is our biggest expense, and what can we do to reduce it? You see, even a 5% saving on your biggest expense can far exceed a 100% saving on something small - like your bank account fee. For example if you spend R4000 a month on groceries, and your bank fee is R150 a month, then a 5% saving on your grocery spend (R200 a month) will be more beneficial to you than a 100% saving on your bank account fee. Make sense? So should we be spending hours navigating the spider web of bank account fees, or is that time better spent looking at ways to reduce bigger expenses (things like housing, cars and groceries)? Over your working career and lifetime, while the small wins can possibly save you 100's of thousands of Rands, the big wins could easily end up saving you millions1. So with this in mind, the obvious question becomes - where is most of our money going every month? So I decided to categorise the expenses on our monthly budget, and see which categories were taking most of our cash monies. One of the first things that stood out for me was the percentage of our money going towards investing. This is commonly referred to as your "savings rate" (and with regards to early retirement and financial freedom, higher is better). So it seems that mine, at 13.6%, is not actually that great. In fact it is way off from those "front of class" Fat Wallet listeners Jo and Conrad. It is also some way behind the Fat Wallet headmistress herself, Kristia. They all brag about waaaay higher savings rates. Ok, so some more detail on where most of my money going. And more importantly, which of the big expenses do I have some control over? So first up - housing. This category includes our bond payment, levies, and rates and taxes. Over a quarter of our entire monthly spend - it's a biggie. At this point in time, not much we can do here though. We made the decision to buy, and so this expense is now locked in. What is encouraging is that the bond payment (which is by the far the largest portion of the housing category expense) will remain constant (assuming interest rates stay the same (maybe I am too optimistic? Or naive? Or both?)) while the other pie chart expenses, in theory, will inflate over time. So as time goes on, this expense would naturally become a smaller and smaller piece of the pie. And of course once the house is paid off, the expense will shrink dramatically. Yup it's true, much less! This category includes food, entertainment and everything else that keeps our household operational. This is something we definitely have some degree of control over. And in fact this has become our focus area. We have been making some headway in bringing this down by shopping more intelligently, and choosing cheaper options where possible. I am hoping to get this down by around 10% - which equates to a 1.65% saving on the entire months expenses (10% of 16.5% = 1.65% yes?). Sounds small, but that is more than our entire cellphone bill, and more than half of our car insurance premium! Right - like I am really going to try cut back here! Unfortunately with both my wife and I still working, somebody has got to look after Junior during the day. (I was horrified to learn we couldn't leave him home alone with a sandwich). We opted for a nanny, which turned out to be about the same cost as the nursery schools in our area, with the added benefit of not having to drive him anywhere (viva car free days and the associated cost savings). Not much saving to be had here. Believe it or not, we actually experienced medical aid deflation this year as we moved onto a different medical aid plan - one which has a technology focus and seems to be aimed at younger (i.e. healthier) clients, meaning it was considerably cheaper than the one we used to be on, with pretty much the same benefits. My wife uses the Gautrain for work, which is not cheap. She has been (and still is) actively looking for something a little closer to home, which would bring this expense down. This category includes all money we put away for expected unexpected expenses - things like our own Medical Savings Account (I choose not to have a PMSA with our medical aid), car services, saving towards a new car, house maintenance etc. Also some voluntary savings - trying to gather some cash for a holiday for example. Now we into the pie slices which are too small to even get a label in the picture. I would say that's a good gauge to start asking if the savings from these slices are going to be worth the time and effort to optimise further if there are bigger fish to fry (assuming you have at least done some work to get it into the lower ranges)? But having said that, it is always a good idea to not get totally ripped. So while we may not have the absolute cheapest insurance deal, I think we are ok. I can move onto these once I have got the grocery expense sorted. Interestingly, saving 50% on our insurance premiums would definitely be helpful, but not nearly as helpful as saving just 10% of our grocery spend each month. If you want to generate a similar chart for your expenses and get a bigger picture view of your spend, you can use the tool below. Just type in your own monthly numbers and check the resulting pie. If there is something that you have in your budget, that is not on the list, you can use the bottom two fields to add your own category (for example the rip off TV subscription DSTV, or Gym Membership, or car payment). If there is something that doesn't apply to you (e.g. no housing cost because Mom's garage is great) then just zero that value (it won't show on the pie). The pie chart will have your expenses sorted from largest to smallest in a clockwise direction. You can check the exact percentage by hovering over the slice. So now you can start asking questions like - should I spend hours and hours on the phone with all the different insurance companies to find the absolute cheapest deal and shave a hundred bucks off my insurance premium? Or should I rather investigate trading in your car for a cheaper one, or moving closer to work? Maybe your rental is quite steep and you don't actually need such a big place? I have seen threads on some forums with people arguing heatedly over a couple of rand saving on bank account fees. Is it really worth the trouble when you still paying off a R600k car for example? Now of course, the small wins can and should be tackled - but only once the biggies have been minimized. My suggestion is to start at the biggest item, ask some hard questions and then do what you can to reduce that expense. Then work your way down the list and repeat. In this way you can REALLY make a dent in your budget. Cutting back on the areas that cost you the most amount of money - who would have thought? What a novel idea! I think most people avoid this line of thinking, because it can result in some very tough decisions with regards to the familiar items in your life (housing, cars, DSTV etc.) and humans really don't like change. But the truth is, if you want to make some serious financial progress, you got to face the difficult questions and take some tough decisions. 1 Of course there is no real benefit if you just end up spending the savings on something else. The savings should be invested in order to get maximum benefit. 2 I enjoy Jack Black movies way more than I should!